It gives "dotty" a slightly new meaning. 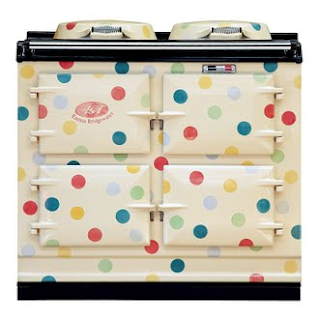 I wasn't in the market for a polka dot range, thought it's terribly cute. It must have been a big success, because it's no longer available. It's not listed at Aga and no longer listed at Emma Bridgewater. But she still has Black Toast, Pink Hearts, Flowers, Birds, Robin, Union Jack, Saltire, Starry Skies, White Toast, Men At Work, Dancing Mice, Dinosaur, Gymkhana, Hellebore, Auricula, Happiness, Polka Hearts, Figs, Wiveton Veg, Kitchen Garden, Pumpkin, Christmas Star, Speckled Hen, Cross And Spot, Tulips, Nice Dream, Kittens At Play, and Matthew Rice to fall back on. So, maybe next time.